As you pass through the imposing brass doors you enter the heart of Gotham Hall to our Grand Ballroom. In a room built for royalty, you will be captivated by the remarkable presence this room commands as you immerse yourself in every lavish detail. Your eyes are instantaneously drawn upward to the miraculous gilded ceiling centered above the inlaid marble floor. In the center of the unique gold-leaf honeycombed design sits a one-of-a-kind 3,000 square foot stained-glass ceiling. Regal granite walls and solid limestone Corinthian columns adorning each end of the hall’s oval further accentuate the grandeur of the architecture. 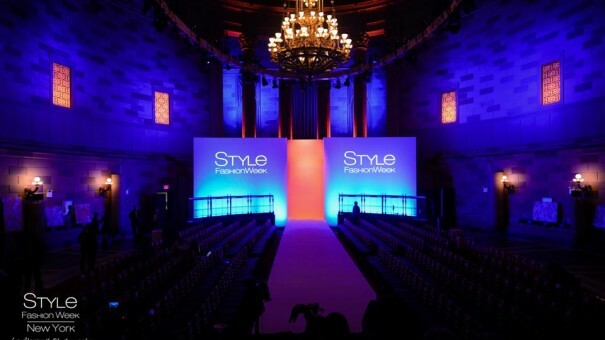 On our main stage is a magnificent 70’ x 8’ runway where designers can showcase their upcoming collections. This room will accommodate up to 900 guests with seating for 400. Our media riser fits over 100 to ensure maximum coverage of your show. Graphics, imagery, logos, and video can be projected onto the side walls.